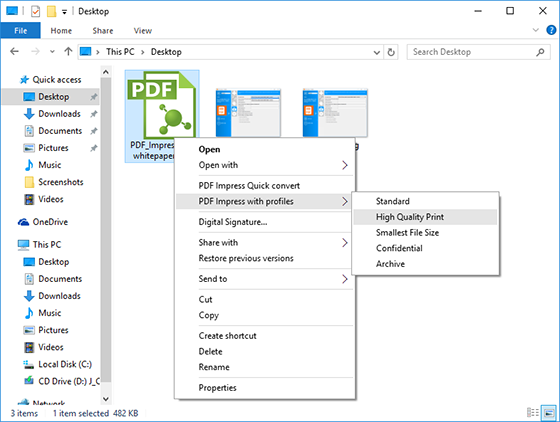 PDF Impress Quick convert and PDF Impress with profiles are used to convert documents via windows shell context menu item (right-click over the supported files in file manager or desktop). This is the fastest and the most convenient method of creating PDF files in Microsoft Windows. Open File Explorer, select document(s) and image(s), then right click on them, a menu will appear. Click “PDF Impress Quick convert” menu item, and selected files will be converted into PDFs. Note: The PDF document (s) will be placed in the same folder as the original and will have the same name as the original but it will maintain the PDF file extension. Select “PDF Impress with profiles” to convert file(s) with profile you select from the sub-menu. Quick convert profile can be defined in PDF Impress Settings and multiple custom profiles can be added. Digital Signature menu can be used to digitally sign PDF files using a digital signature stored in Windows Certificate Store, USB eToken or Smartcard. Learn more and download trial of PDF Impress here.